This bodice, now separated from its skirt, is made from black silk which has become discoloured with age owing to the instability of fixatives used in the dying process. It is trimmed down each side of the front and around the sleeves with bands of crape, a dull crimped silk associated with mourning. 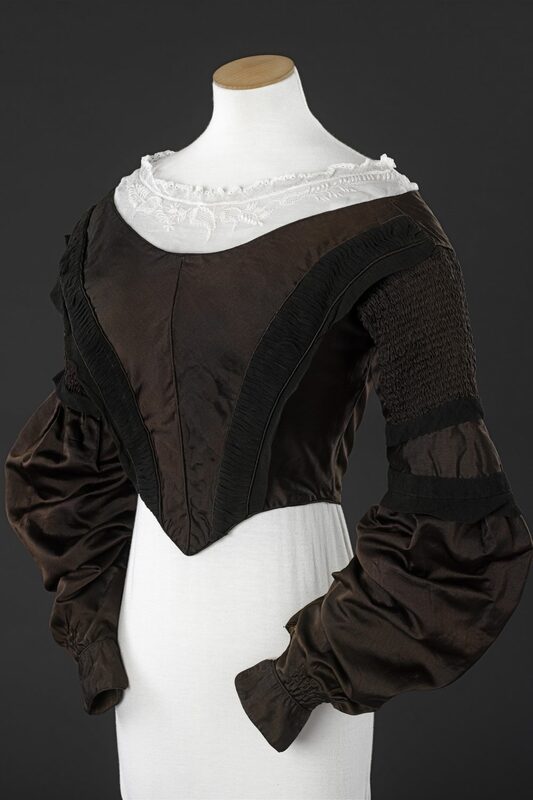 The fabrics and trimming of women’s dress after a death were dictated by the stages of mourning; black bombazine, a dull silk and worsted material, trimmed with crape, was used for the first, deepest stage, followed by black silk, also crape- trimmed, for the second stage. The bodice’s pointed waistline and its sleeves, with their ruched upper parts and gathered lower sections, show the transition during the last years of the 1830s from straight horizontal waists and full leg of mutton sleeves. If its original wearer had been a woman who kept up to date with the latest fashion it is possible that the bodice was worn in mourning for King William IV, who died in 1837. Acknowledgement of the death of a monarch was expected of his subjects and orders giving the requirements for public mourning were published in the press.